What is the best longarm quilting machine? What features are important and how do you know you will even like it? It can make your head swim trying to make such a major purchase! Before buying a longarm access your goals, needs and budget. Consider how your needs will change as your skills increase, too. How Much Does A Good Longarm Quilt Machine Cost? There is a wide range of price points for a longarm machine but keep in mind that, unfortunately, this is one of those things in life that you get what you pay for. If your budget can’t stretch that far consider a used machine from a quality brand with a warranty. Remember that you did not get into quilting to be a mechanic- you want to be a quilter! A quality longarm machine that just plain works without having to tinker with it every time is going to cost more than you might think. The best ones will certainly cost more than a high end sit down domestic sewing machine. Think of this like buying a boat. 🙂 Sure, you could spend less and get a rowboat but more money will get you something that is much easier to use. Get the best possible machine you can afford and it will reward you with a long, hassle free life. Choose your quilting machine dealer and brand carefully. This is the person and the company you will lean on for service and support. How long have they been selling and making stand up quilting machines? Look for longevity here. If they’ve been around less than 10 years you may want to move along to someone (and a company) with more experience. Are there classes you can take? How responsive are they to your questions? Do you like them and trust them? Here at Quilted Joy, Angela has been selling longarms since 2007. Specifically you want to know about the electronic portion of the warranty. Most company’s have a separate rider for the electronic portion of the warranty and most only cover it for 1-2 years. However, it is the electronics you are worried about! You will learn a lot about what the manufacturer thinks about their machine from the warranty they offer. Get a long one! Ours is a lifetime warranty! Needle Speed or SPM– This number will tell you wether you are dealing with an industrial grade machine or a domestic machine that isn’t as heavy duty. Personally, I wouldn’t go below 2400 stitches per minute (SPM) but my preference is above 3500 SPM or above. Remember that you won’t actually be stitching that many stitches per minute or more- this number just reflects wether the motor has enough “ceiling” to rev and respond by quickly speeding up when you change directions so you will get a point in your points of your stitching line. Responsive Stitch Regulator– All quilting machines with a stitch regulator will give you nice stitches in a curvy line. The real test is zig zag lines with sharp directional changes. And when test driving go fast and move the machine to the left and towards the rear corner of the table from the needle side of the machine. This direction can be difficult for some longarm machines to stitch well due to the counter clockwise rotation of the hook. During the test drive look closely at your stops and starts. Are their long stitches? Do you have points in the zig zag directional changes? Do your stitches look even? Put the machine through its paces and see how it responds! Simplistic Thread Path– You want to play with a variety of threads, right? A longarm machine has a super long thread path and the thread goes through the eye of the needle 30-40 times before it every takes a stitch! We are asking a lot of that top thread. Take a look at the thread path on the machine. Is it simple? Or, are there lots doo-dads the thread has to travel through before it gets to the needle? If you see multiple discs the thread must travel between it will put more pressure on the top thread and some finicky threads won’t put up with the abuse. Look for simplicity in the thread path so you can run very low tension on the top thread. Many folks get enamored by the longarm machine itself and forget to look carefully at the frame/table. However, the frame has a direct impact on the end product. You want a heavy duty all metal frame- no plastic! You do not want any junctions in the rails that the machine rides upon or in the poles the quilt gets attached too. Over time these junctions will give you a little bumpity bump as the machine rides over those junctions which will effect your stitching line. Having junctions in the poles the quilt gets attached too will result in a sway in those poles over time which will prevent you from ending up with a square quilt when you are done. Also look for a frame with two poles in the rear position. One will be the pickup roller which your completed quilt will roll up upon when it is finished. The second pole will keep your work surface level so your tension remains the same when working from the front or back of the table. If you don’t have that second pole in the back of the table you’ll need to raise/lower your takeup bar manually which increases tension issues. There are a number of places around the country that rent out time on their longarm machines so you can play in the sandbox before deciding that you are ready to buy. 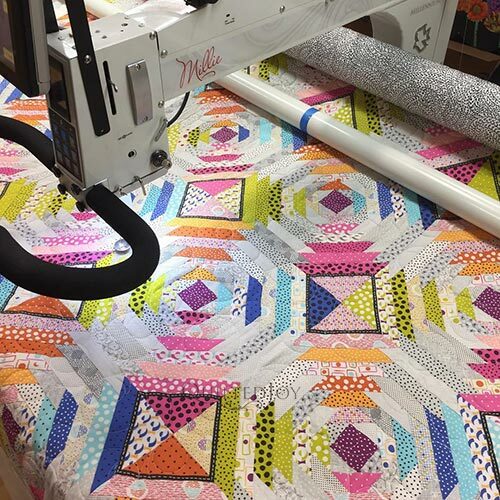 We have 8 APQS longarm machines in our studio in Louisville, Ky you can rent by the hour and you get a helpful Quilt Fairy to guide you every step of the way! Have More Questions or Want to Schedule a Test Drive? Previous post: Happy Thanksgiving from Quilted Joy! Next post: Longarm Guild: Getting Fancy with Circle Rulers!